One of the new improvements introduced in Firebug 1.11 beta 1 is better monitoring of messages sent between frames/windows. These messages are sent via window.postMessage. It places a message in the message queue associated with the thread that created the specified window and returns without waiting for the thread to process the message. Let's see a quick example showing how to use postMessage(). As soon as the monitoring is on and a message is sent to iframe, you should see a log in the Console panel. 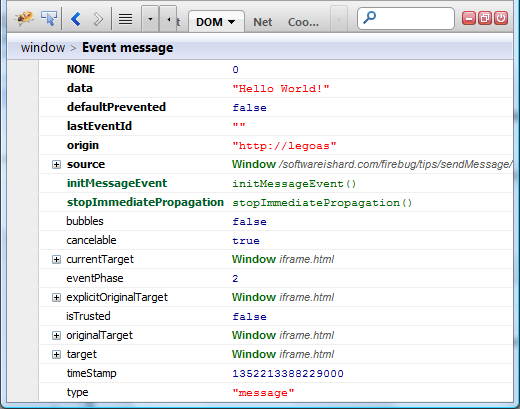 If you click the log you'll be navigated into the DOM panel for detailed inspection of the MessageEvent object. Check out the next screenshot. Install Firebug 1.11 beta 1 and checkout live example!